Mothers are hit the hardest when we are talking about the gender pay gap that still exists within the UK workplace today. The gender wage gap in the UK is admittedly the lowest it’s ever been, with women receiving ‘only’ 18% less per hour than men. However, mothers are still the group suffering the biggest pay difference- the gap widens consistently for 12 years after the first child is born, by which time women receive 33% less pay per hour. Andrew Chamberlain, an economist, says “British working mothers are significantly worse off than those without family responsibilities, and this pressure will not help the UK address its workplace diversity issues”. Before women decide to start a family, the employment rates of men and women are almost identical, allowing an equal representation in the workplace which provides the same advancement opportunities. However, this then changes as soon as a child is brought into the picture. Between the year before and the year after birth, women’s employment rates drop by 33%, whilst this barely changes for men. This discriminatory pattern of exclusion has major impacts on the economy and society , as women will either become unemployed or be pushed in lower paid, less skilled work, with only room for men at the top. The inequality suffered by most mothers in the UK not only affects their livelihoods and wellbeing and that of their families’, but also that of the country as a whole. Women make up 47% of the British workforce, and are hence vital in the productivity and overall success of our economy and society. Unleashing women’s full workplace potential could be worth an estimated £170 billion, enabling the economy to grow by 10%. If the current situation continues, it would take the UK 41 years to close its gap. This shows that we all benefit from abolishing the gender wage gap and discrimination in the workplace. As explained by the A Fair Deal for Women, “not only does it make moral sense, it also makes good financial and economic sense too”. So, why do mothers take the brunt of the gender wage gap? According to traditional gendered stereotypes, mothers are expected to be the parent who should predominantly stay at home to provide childcare for babies and young children, leading to high levels of part-time employment. This means mothers lose out on full-time salaries promotion opportunities may be delayed, as their skills and potential as part-time workers are not as recognised. This means they accumulate ‘less labour market experience’ and are regarded as less efficient than someone having gained skills on full-time basis. This stereotype of women is an outdated and frankly redundant ideology that needs changing. While the wage gap for women in the UK with no children is slightly more than 7%, for those with at least one child it leaps to 21% – an alarming and pressing issue affecting how children are brought up within the UK. A mother, Kate from Oxford, has felt the full impacts of ‘the motherhood pay penalty’. She explains, “I decided to return to my job on an 80% contract, to manage childcare. Since my return, I’ve had almost all of my responsibilities and projects stripped […] I’m now set to perform badly in this year’s review which will affect my bonus and pay rise next year”. Pigeon-holing women into unsuitable and limiting roles due to the ‘hassle’ of companies having to provide flexible working arrangements to enable mothers to meet childcare responsibilities, is just another form of gender discrimination and one which will actually hamper most workplaces’ economic progress. So, what can be done to stop the ‘Mums’ penalty’ and prevent further gender discrimination in the workplace? Recent legislative and policy changes are making it harder for employers to ignore the motherhood penalty and gender pay gap. In 2017, 8,000 employers with more than 250 staff will have to reveal their gender pay and bonus gap. Although this will shed some light on the apparent gender discrimination within workplaces, it is unlikely to bring an end to unequal opportunities for mothers. The government also provides 30 hours of free childcare for working families with 3 and 4 year olds. Now, whilst this is excellent progress, it’s simply not enough for mothers with children of all ages. One of the major hurdles in getting women back to full-time work is expensive childcare, with an average part time nursery place now costing up to £6,000 a year. Wouldn’t it just be better to subsidise childcare from infancy right up to adolescence? State childcare should start as soon as paid parental leave is over. A free part-time nursery place should be available from when a child reaches nine months, with extra hours on top of that capped at £1 an hour. The Women’s Equality Party sums it up well, “Of course, lots of mothers and fathers want to spend time at home with their young families. But at least 600,000 stay-at-home parents would prefer to work if they could afford to do so”. A more controversial solution is to allow babies into the office. 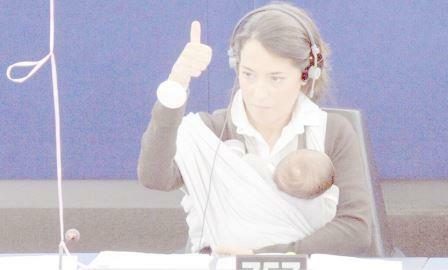 When Licia Ronzulli, Italian politician took her six-week-old baby to the European Parliament in September 2010, the pictures caused a media stir. 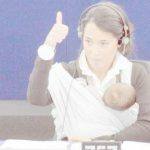 She said her decision to bring baby Vittoria in to vote was not a political gesture but a maternal one because she was breastfeeding. Through providing clear rules and a formal structure, this can be a viable option for the modern day workplace. Enforcing paternity leave in the UK is arguably the best way to equalise the importance of childcare and career progression for both genders. In the UK currently, a man can only take 2 weeks paternity leave, which is paid at the statutory level of just £139.58 a weekWhile Shared Parental Leave is an important step in the right direction, it is still a long way off an equal system of parental leave shared between the parents. There are many more solutions to this problem, such as flexible working to enable parents to work from home or increasing the wages of low paid work, which is often feminised. Giving all women an adequate pay rise so that they are paid the same as men with equivalent skills and experience, it will not only see the end of the gender pay gap, it would increase the diversity of the workforce in the UK, allowing the economy to grow exponentially. But most importantly, it will be a major step forward in promoting gender equality both in the workplace and within families. This blogpost was written as part of the second year undergraduate module, Culture, Identity & Place, taught by Ruth Evans and Sally Lloyd-Evans, Department of Geography & Environmental Science. The views expressed in this blogpost are the author’s and do not necessarily reflect the University of Reading’s position. Look out soon for new blog posts that some of our Geography undergraduate students have written about gender and diversity issues.